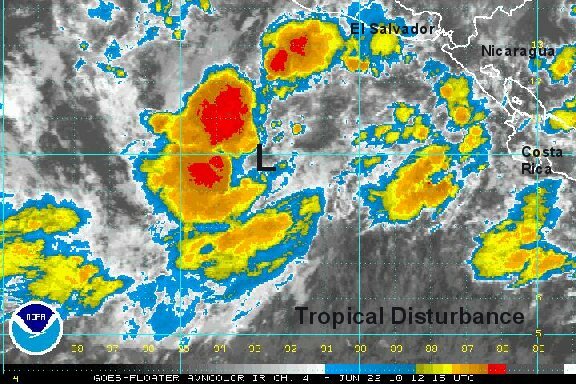 A tropical disturbance is off of the central American coast from Guatemala. A rotation is now noted and a tropical depression will likely form in the next 12-24 hours. As of 9:00 am edt / 6:00 am pdt the tropical disturbance was centered at 9.8°N / 92.8°W or a few hundred miles south of Guatemala. Movement is to the west at about 5 mph. Top sustatined winds are estimated at 25 mph. A tropical depression appears to now have formed. A broad low is becoming more defined and we expect this system to be classified sometime later this evening. 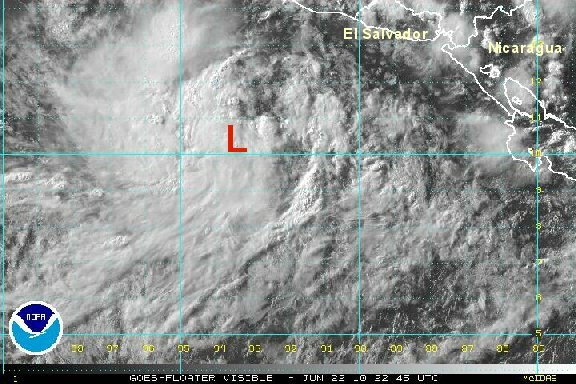 As of 8:00 pm edt / 5:00 pm pdt the tropical disturbance was centered at 10.5°N / 93.5°W or over 400 miles southeast of Puerto Angel Mexico. Top sustained winds are estimated at 25 mph. Darby is a small tropical storm, because of this, it is possible for it to strengthen or weaken rapidly. We still believe that the hurricane center is over-estimating Darby's strength. with top sustained winds of 70 mph, gusts should be near 85-90 mph. We just don't see this being the case at all. A recent satellite estimate came in with 49 knots. On a positive note, the latest forecast models keep Darby offshore instead of turning it into Mexico. Interests on the west coast should follow Darby closely. As of 7:00 am edt / 4:00 am pdt tropical storm Darby was centered at 12.7°N / 98.2°W or 235 miles south southwest of Puerto Angel, Mexico. Top sustained winds are estimated at 55 mph (NHC 70 mph). Movement was west northwest at 12 mph. NHC has classified Darby as a hurricane at 75 mph. Satellite impression looks much better over the last several hours. A full update will be made later today. 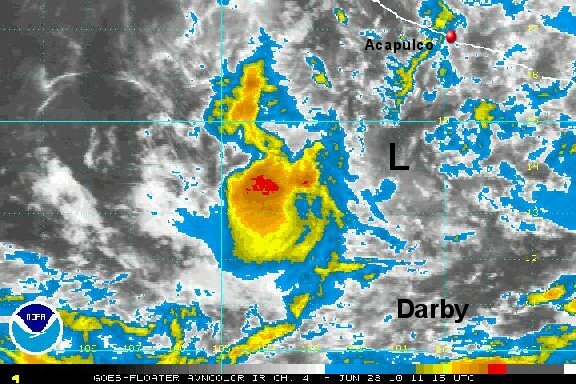 Satellite imagey has shown that Darby has strengthened today. We continue to keep Darby below the wind speed estimates of the hurricane center. No eye is apparent with Darby. The latest forecast turn Darby toward Mexico's central coast in a few days, but well offshore. As of 7:00 pm edt / 4:00 pm pdt tropical storm Darby was centered at 12.9°N / 99.5°W or 265 miles south of Acapulco, Mexico. Top sustained winds are estimated at 70 mph (NHC 80 mph). Movement was west northwest at 8 mph. 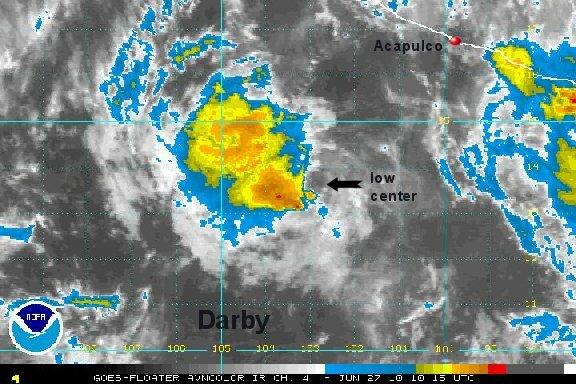 Darby continued to strengthen overnight with its CDO (central dense overcast) expanding some. An eye now has been visible for several hours. A new satellite estimate recently came in with 85 knots. We're going to go higher than that with the recent strenghtening tend and agree with NHC for a wind estimate of 105 mph. Keep in mind that the area that these strongest winds cover is extremely small, due to the size of Darby's eyewall. The forecast track of Darby will be dependent on the development of a low pressure system in the western Caribbean Sea. The model consensus is to take Darby west northwest for another day or two, slow it down, and turn it east toward Mexico as it weakens. As of 7:00 am edt / 4:00 am pdt hurricane Darby was centered at 13.5°N / 100.8°W or 235 miles south southwest of Acapulco, Mexico. Top sustained winds are estimated at 105 mph (NHC 105 mph). Movement was west northwest at 13 mph. 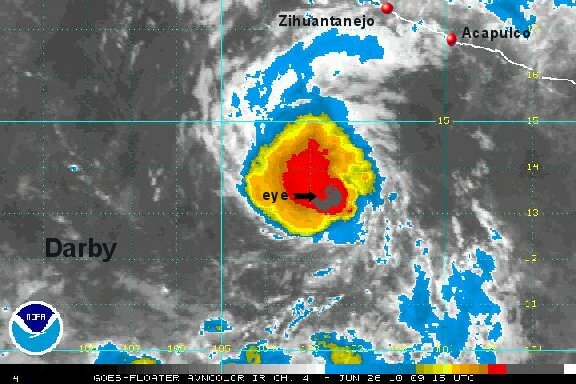 Darby has shown intensification still today, displaying an excellent eye feature. The eyewall continues to cool indicating continued strengthening. Darby remains small, so the strongest winds are not far from the eye. The steering flow will likely become weak over the next 2-3 days, so Darby speed will slow dramatically. 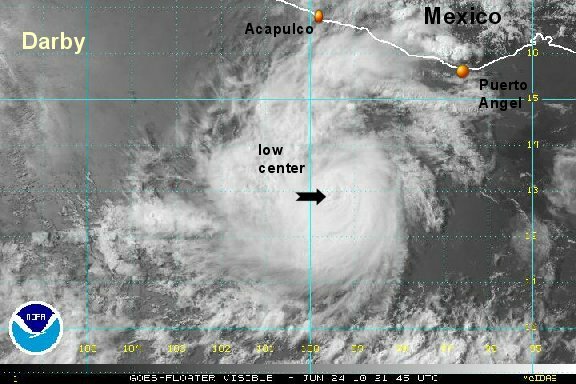 As of 4:00 pm edt / 1:00 pm pdt hurricane Darby was centered at 13.7°N / 101.5°W or 240 miles southwest of Acapulco, Mexico. Top sustained winds are estimated at 125 mph (NHC 120 mph). Movement was west northwest at 6 mph. The CDO or central dense overcast of Darby became elongated overnight. This suggests a not a well organized structure. More recently - over the last hour or two - deep convection has started to exploded over the eyewall. We think that Darby may have weakened to about 95 mph a few hours ago, but is up to around 105 mph again. 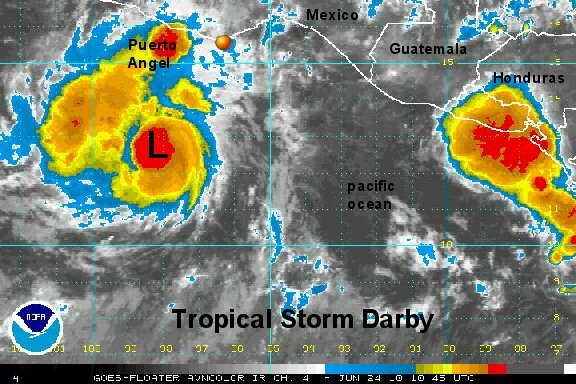 As of 5:00 am edt / 2:00 am pdt hurricane Darby was centered at 13.5°N / 102.7°W or 300 miles south southwest of Zihuatanejo, Mexico. Top sustained winds are estimated at 105 mph (NHC 110 mph). Movement was west at 6 mph. Darby will go through light steering winds the next 1- 1 1/2 days before turning toward the central coast of mexico. Darby has been struggling under easterly winds aloft. In fact, it looks like the center is now exposed - east of the official NHC estimated location. Deep convection is still on the western side of the storm, but not enough to classify Darby at 60 mph.....we are going considerably less. Darby will likely continue this weakening trend as it drifts toward the coast of Mexico in the next few days. 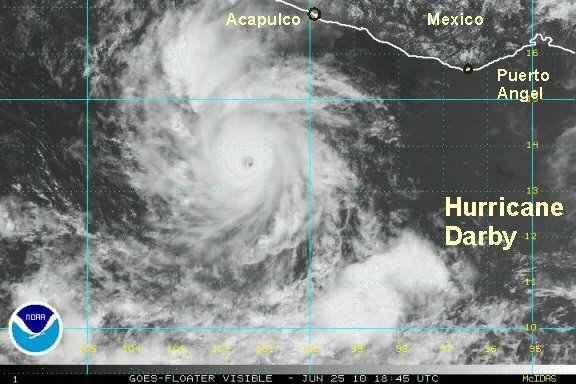 As of 8:00 am edt / 5:00 am pdt Darby was centered at 13.7°N / 102.8°W or 285 miles south southwest of Zihuatanejo, Mexico. Top sustained winds are estimated at 45 mph (NHC 60 mph). Movement was nearly stationary. Darby continues to look weak. There is some deep convection on the west side of the circulation. With this being said, we think that NHC's 50 mph wind estimate is too high. After stalling for several hours an easterly drift has now started. At this time there is no impact to Mexico. 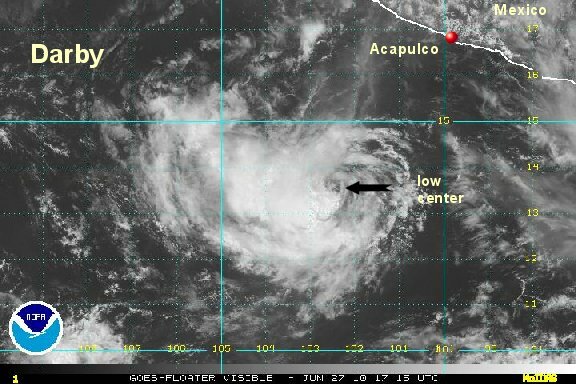 As of 3:00 pm edt / 12:00 pm pdt Darby was centered at 13.7°N / 102.6°W or 280 miles southwest of Acapulco, Mexico. Top sustained winds are estimated at 40 mph (NHC 50 mph). Movement was east at about 3 mph. Interests on the west coast should follow Darby. Strong easterly winds aloft continue to impact Darby. After a very impressive burst overnight, convection has now quieted down. At this time there is no impact to Mexico. 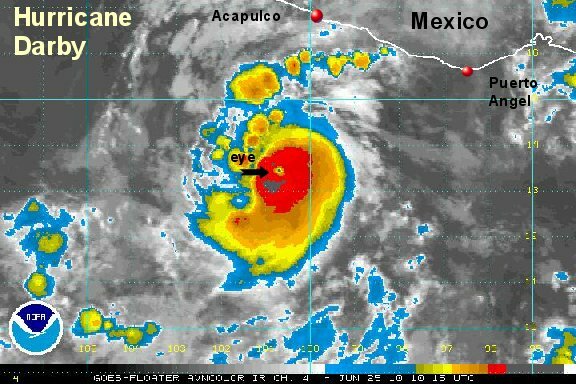 As of 8:00 am edt / 5:00 am pdt Darby was centered at 14.3°N / 101.1°W or 190 miles southwest of Acapulco, Mexico. Top sustained winds are estimated at 35 mph (NHC 40 mph). Movement was east northeast at about 6 mph. Darby has dissipated, but numerous showers and storms are on the coast of southwest mexico with locally heavy rainfall.